(C) 2013 Felipe N. Soto-Adames. This is an open access article distributed under the terms of the Creative Commons Attribution License 3.0 (CC-BY), which permits unrestricted use, distribution, and reproduction in any medium, provided the original author and source are credited. A new genus of Isotomidae, Bellisotoma gen. n., is described. The new genus is a member of the Proisotoma genus complex and is characterized by a combination of having a bidentate mucro with wide dorsal lamellae that join clearly before the end of mucronal axis without forming a tooth and one strong ventral rib with basal notch that articulates with dens; having abundant chaetotaxy on both faces of dens; and abundant tergal sensilla. Bellisotoma gen. n. shows a furcula adapted to a neustonic mode of life, and may be a Isotopenola-like derivative adapted to neustonic habitats. Subisotoma joycei Soto-Adames & Giordano, 2011 and Ballistura ewingi James, 1933 are transferred to the new genus. In the process of reviewing new North American species described since the last edition of the Collembola of North America (Christiansen and Bellinger 1998), it became evident that the recently described Subisotoma joycei Soto-Adames & Giordano displays a combination of characters that excludes it from any and all currently accepted genera of Isotomidae. Retention of Subisotoma joycei in Subisotoma Stach would further expand the morphological diversity of species assigned to an already morphological heterogeneous genus. In this contribution, we describe the new genus, add some comments to the original description of Subisotoma joycei and transfer Ballistura ewingi James to the new genus. Bellisotoma Soto-Adames, Giordano & Christiansen, gen. n.
Subisotoma joycei Soto-Adames & Giordano, 2011. The new genus is dedicated to Ross and Joyce Bell, in celebration of their contributions to the study of the entomological fauna of Vermont. General body shape short and stout, with sudden bend between abdominal segments 4-5 as in Folsomides. Cuticle smooth, granular complex formed by single light granules surrounded by 4-7 darker granules (Fig. 1), granular complexes irregular. Basal microsensilla on antennal segments 3-4 not differentiated; second antennal segment with 3 basal microsensilla; first antennal segment with 17-18 setae, 2 basal microsensilla, 3 basal ventral sensilla and 2 other distal sensilla. Prelabral setae 2; outer maxillary lobe with apical seta simple, sublobal plate with four appendages; labial palp with three proximal setae, all papilla present, guard seta e7 absent. Tergal microsensilla formula 10//101; number of tergal sensilla variable, but adults always with more than eight sensilla on each segment; medial abdominal sensilla inserted either on or just anterior to posterior row (Figs 7–8). Ventral thoracic setae absent. Sterna of second abdominal segment without isolated field of setae. All legs with more than 21 setae; legs with 1-3 weakly capitate or acuminate tenent hairs; setae B4 and B5 present, B5 longer than B4; adult males with setae B5 and x modified. Manubrium without ventral setae. Dens smooth, cylindrical, and shorter than manubrium; dorsal setae long and abundant, distributed throughout dens length; ventral setae few and restricted to distal half of dens. Mucro bidentate (Fig. 2), about half as long as dens, fused to dens dorsally, articulated ventrally; with wide dorsal lamellae that join clearly before the end of mucronal axis without forming a tooth (Fig. 3), and a ventral rib with basal notch that articulates with dens (Fig. 4). Bellisotoma joycei. 1 Ornamentation of dorsal cuticle of head 2 Lateral view of mucro, holotype 3 Oblique view of mucro, specimen from Quebec, hatched lines represent ventral rib and mucronal articulation 4 Ventral mucronal rib and articulation 5 Lateral view of fronto-clipeal region (Ant. 1-2 are 1st and 2nd antennal segments) and labrum (Lm) showing relative placement of prelabral setae 6 Dorsal view of prelabral region, only the inner setae are inserted just basal to labral suture, arrows point at corresponding seta on lateral view of head 7 Chaetotaxy of thorax 2- abdomen 3, asterisks identify microsensilla 8 Chaetotaxy of abdomen 4-5 (from Soto-Adames and Giordano 2011). Bellisotoma ewingi, lectotype 9 Structure of mucro (phase/contrast), dorsal and lateral views 10 Scan of lectotype slide and detail of habitus (DIC) showing general condition of specimen. Bellisotoma gen. n. belongs to the Isotopenola-Subisotoma genera complex, but unlike these genera, the new genus shows a furcula adapted to a neustonic mode of life, as evidenced by the thick polychaetotic dens and lamellate mucro. Bellisotoma gen. n. differs from all other genera by the combination of having a mucro with lamellae that join subapically without forming a tooth, by the presence of a large number of dorsal setae on dens, presence of sensillar polychaetosis, smooth cuticle and second abdominal sternum segment without isolated setae field. The new genus is similar Isotopenola Potapov, Babenko, Fjellberg and Greenslade and Subisotoma, as circumscribed by Potapov et al. (2009), in having reduced number of prelabral setae, simple outer maxillary palp, reduced number of guard setae on labial papilla E, reduced microsensillar chaetotaxy, absence of tibiotarsal seta B4/5 and smooth dens (Table 1). The three main characters given above distinguish the new genus from Subisotoma, whereas the new genus additionally differs from Isotopenola in the number of guard setae on labial papilla E (6 in Bellisotoma, 4-5 in Isotopenola). Bellisotoma joycei keys out to Ballistura in Potapov (2001), but the two genera are clearly distinguished by maxillary palp structure, sensillar and microsensillar formulae, absence of tibiotarsal seta B4/5 and dens sculpturing. Additional differences between the new genus and other genera in the Proisotoma complex (Potapov 2001, Fjellberg 2007, Potapov et al. 2006, 2009) are listed in Table 1. One other North American species, Ballistura ewingi (see below), belongs in the new genus. Members of the new genus may be either psammophilous and/or acidophilus. The individuals of Ballistura joycei from Vermont were collected on sandy shores of Lake Champlain and the individuals from Quebec on acidic sandy soils (pH 3.75; Therrien et al. 1996) in a sugar maple grove ≈28Km east of the St. Lawrence River. The exact topotypical locality of Ballistura ewingi is not clear, but the soils around Vicksburg, Mississippi are also acidic, sometimes sandy. Diagnostic characters for selected genera in the Proisotoma genera complex in comparison with Bellisotoma gen. n. Characters based on Potapov (2001) or Potapov et al. (2006, 2009). Modified from Soto-Adames and Giordano (2011). Bellisotoma joycei (Soto-Adames & Giordano), 2011, comb. n.
Holotype (Illinois Natural History Survey [INHS] Insect Collection accession number 551, 608) and 3 paratypes (INHS Insect Collection accession numbers 551, 610; 551, 611; 551, 621): USA, Vermont, Grand Isle Co., South Hero, White’s Beach, N44.62189, W73.32273, sand and thick layer of aquatic plant debris, October 2005. 2 paratypes (INHS Insect Collection accession numbers 551, 609 and 551, 612): Vermont, Grand Isle Co., Grand Isle, Pearl Bay, west of intersection of East Shore North Rd. and Hide Point West Rd., N44.73078 W73.26401, sand with sparse remains of aquatic plant debris, October 2005. CANADA, Quebec, 9115 (1994), St. Jude, sugar maple leaf litter near N45.78333, W72.93334, Berlese MO-SJ-2, identified as Proisotoma (Ballistura) ewingi on the label (this slide contains 7 specimens and is deposited in the A.J. Cook Arthropod Research Collection at Michigan State University). The specimens from Quebec were originally identified as Ballistura ewingi, but in the key character that separate Ballistura joycei from Ballistura ewingi (number of distal setae on the collophore) they are identical to Ballistura joycei. All specimens from Quebec are small, the largest measuring only 0.78 mm. Two of the seven individuals from Canada are males. In the largest male the genital plate is well developed, but it appears to be closed, and neither males has modified metatibiotarsal setae. These males are either subadults of adults in reproductive quiescence. In the specimens from Vermont the number and size of eyes varies, and one individual is blind (Soto-Adames and Giordano, 2011). In the individuals from Quebec the number of eyes is constant, except for one specimen in which eye G is missing on one side of the head. Dorsal views of the prelabral region suggest the presence of 4 prelabral setae (Fig. 6), but a lateral view of the head (Fig. 5) clearly shows that the outer setae are displaced posteriorly, away from the labral suture, and are not prelabral in the usual sense. One individual from Quebec has only one prelabral seta. The number of microsensilla is somewhat variable. Most individuals have 10//10100 microsensilla, but one specimen from Vermont has one microsensillum on the metathorax, and the two males from Quebec have 2 microsensilla on the first abdominal segment. The shape of the tenent hairs is difficult to ascertain in the specimens from Canada. In the two smallest individuals (0.69 mm) all tenent hairs seem acuminate, whereas in the larger specimens there are 111 capitate and 011 acuminate tenent hairs. Most individuals have 3 tenacular teeth, but two have 3+4 and one has 2+3. Bellisotoma ewingi (James), 1933, comb. n.
Mississippi, Vicksburg; in decaying leaves and twigs, October 2, H.E. Ewing, coll. ; Lectotype, designated by J.T. Salmon, 1958; original US National Museum of Natural History catalog number 42981; current catalog number 9026. The description provided by Folsom (1937) suggests that Ballistura ewingi and Bellisotoma joycei are very similar, sharing characters such as cuticle ornamentation, presence of 3 guard sensilla on the third antennal segment, distal tibiotarsal subsegmentation, and general eye, claw and furcula structure. Of the three main characters used to diagnose Bellisotoma, Ballistura ewingi has the large number of dental setae and the general lamellate structure of the mucro. The only diagnostic character remaining to be scored for Ballistura ewingi is the sensillar polychaetosis. We studied the lectotype of Ballistura ewingi, but the specimen is in such poor condition (Fig. 10) that most characters could not be scored. The few characters we were able to observe are: tergal sensilla present, although clearly seen only on Abd. 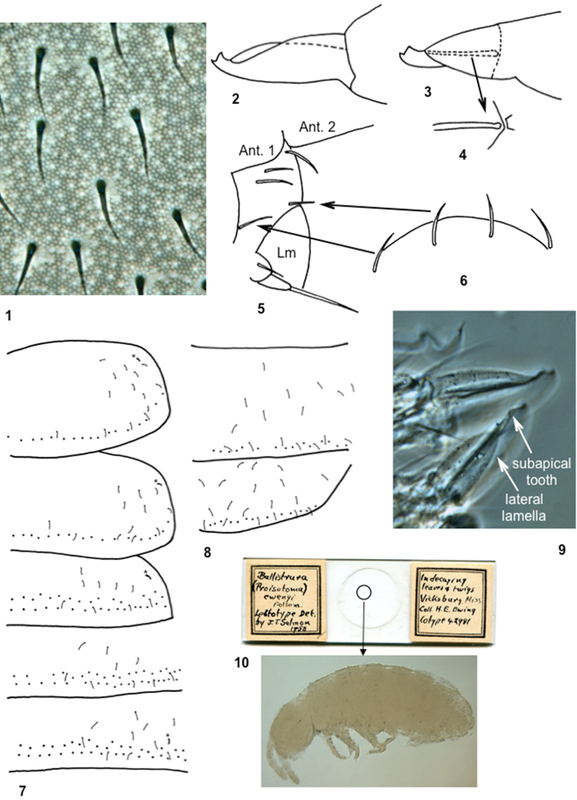 4; tibiotarsal setae B4 and B5 present; tenent hair apparently 1, 2, 2, and acuminate; tenaculum with 3 teeth; dens ventrally with 4 setae; mucro with two lamellae as in Fig. 9. The tenent hairs and tenacular teeth in the lectotype of Ballistura ewingi are as in Ballistura joycei, and differ from the numbers reported by Folsom (1937) (2, 2, 2 or 3, 3, 3 hairs; 2 teeth). This leaves only the number of distal setae on the collophore to distinguish Ballistura joycei (11 setae ) from Ballistura ewingi (4 setae), and it is possible that James species is a senior synonym of Ballistura joycei. However, the condition of the lectotype is such that we prefer to await the study of fresh material from Mississippi before proposing a definite change in nomenclature. In any case, the similarities between ewingi and joycei listed above, justify the transfer of ewingi to the genus Bellisotoma. We thank Gary Parsons, Michigan State University, for the loan of the Canadian specimens of Ballistura joycei, and Fernand Therrien and Madeleine Chagnon for information on the collection site of the Quebec samples of Ballistura joycei. Jonathan Coddington made available the lectotype of Ballistura ewingi deposited in the National Museum of Natural History, and Andrew Miller provided access to the DIG microscope and digital camera. We also thank the anonymous reviewers for their enlightening comments. Christiansen K, Bellinger P (1998) The Collembola of North America north of the Rio Grande; A taxonomic analysis. 2nd ed. , Grinnell College, Grinnell, Iowa, 1518 pp. James HG (1933) Collembola of the Toronto region with notes on the biology of Isotoma palustris Mueller. Transactions of the Royal Canadian Institute 29: 77–116 + 4 plates. Potapov M (2001) Synopses on Palaearctic Collembola, Volume 3, Isotomidae. Abhandlungen und Berichte des Naturkundemuseums, Görlitz 73: 1-603. Potapov M, Babenko A, Fjellberg A (2006) Taxonomy of the Proisotoma complex. Redefinition of genera and description of new species of Scutisotoma and Webercantha (Collembola, Isotomidae). Zootaxa 1382: 1-74. Potapov M, Babenko A, Fjellberg A, Greenslade P (2009) Taxonomy of the Proisotoma complex II. A revision of the genus Subisotoma and a description of Isotopenola gen. nov. (Collembola: Isotomidae). Zootaxa 2314: 1-40.